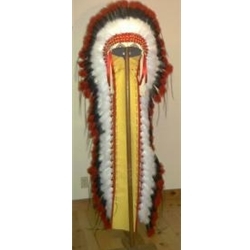 PROBABLY THE MOST RECOGNIZED ITEM OF NATIVE AMERICAN INDIAN REGALIA, THE WARBONNET AS WE KNOW IT TODAY HAS EVOLVED OVER SEVERAL HUNDRED YEARS. 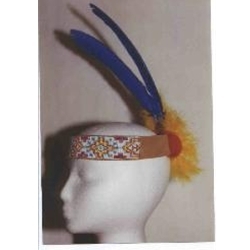 OUR WARBONNETS ARE MADE WITH ONLY FIRST QUALITY MATERIALS. WE USE ONLY LEATHER LOOPS AND LEATHER LACING, WE HEAT STRAIGHTEN OUR QUILLS (RATHER THAN CRIMPING) AND WE GLUE OUR LOOPS (NOT STAPLE THEM). WE OFFER YOU UNSURPASSED QUALITY FOR THE PRICE WITH DELIVERY IN A TIMELY FASHION. 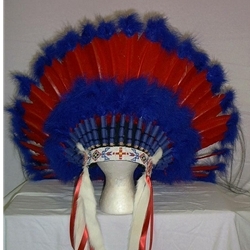 PLEASE ALLOW 2 WEEKS FOR DELIVERY ON READY MADE WARBONNETS. 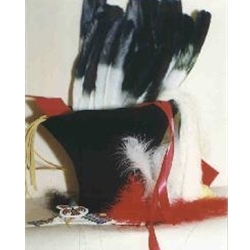 AS IT WAS A SYMBOL OF PRIDE AND STRENGTH TO THE CHIEF AND TRIBES THROUGH HISTORY, LET IT ALSO BE TO YOU. FOR SPECIAL STYLE BONNETS SEE THE SPECIALTY BONNET SECTION IN THIS CATAGORY.